Before starting any exercise – walking, running, or working out, it’s very important that you stretch your legs to warm up muscles, tendons, and ligaments. Warm muscles are less prone to injury.It’s also a good idea to stretch after exercise to avoid stiff or sore muscles the next day. Stand facing a wall (or tree) and use your hands to support you. Put the leg that you are stretching behind. Keep your back knee straight and your heel on the ground. Make sure your foot is facing straight ahead and not turned out. Feel the stretch in your calf muscle. Stand facing a wall (or tree) and use your hands to support you. Place one foot slightly behind the other. 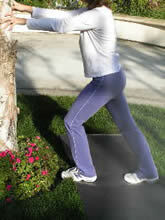 Bend both knees, keep the heels on the ground, and put a little more weight on your back leg. Make sure your foot is facing straight ahead and not turned out. Feel the stretch deep in the calf muscle. Hold the stretch for 30 seconds and repeat 2-3 times on each side. Stand tall and grasp foot to buttock. Make sure that your knees are together. Feel the stretch in your thigh muscle. Tilt your pelvis down by contracting your abdominal muscles to prevent arching your back.